The Blake Shelton biography may be quite interesting to his biggest fans, as he has had a lot of ups and downs in his life. Born in Ada, Oklahoma in 1976, Blake Shelton is now a 42-year-old superstar with a birthday in June. He didn’t begin life that way, of course, but he moved to Nashville at the young age of 17 to pursue his dreams. 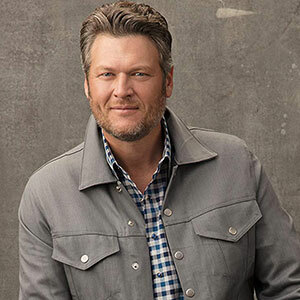 There are many facts about Blake’s life that just make him that much more entertaining, he started touring bars singing at the age of 16, and shortly after high school he was on his way to becoming a country singer. Now with a $60 million-dollar net worth, Blake is one of the top paid entertainers in the country genre today. Born Blake Tollison Shelton to Richard a used car salesman, and Dorothy Shelton, who was a beautician. Blake also has siblings named Endy and Richie Shelton, who are not in the spotlight. Endy is a jewelry designer at Endy Designs, Blake and his sister are each other’s biggest fans, they have an incredible bond that cannot be broken. Richie, Blake’s lost brother, who passed away in a car accident when Blake was 14, Ronnie was Blake’s half-brother- he was Dorothy’s son from her first marriage. Sadly, Blakes father Richard as well passed away in 2012. Although Blake is an incredible singer and entertainer, it seems that he was not the most formally educated man. He graduated from Ada High School, and did not pursue college, instead he went on to achieve much greater things in his music career. Although he did not go to college, he is still a very smart and respected man. Beginning right out of high school Blake worked at a music publishing company where he created songs for other artists. Soon, this wasn’t enough for him, and he decided to sign a contract with Giant Records. That was when he released his debut song "Austin". This was Blake Shelton’s first hit, but weeks later Giant Records closed its doors, so Blake had to find a new place to sing his music. After that Blake Shelton songs started to play even more on the radio, in 2003 he released his second album "The Dreamer". The albums kept coming as he released several after "The Dreamer", including Blake Shelton’s "Barn and Grill", "Startin Fires", "Red River Blue", and many more. As his fame started to grow, so did his love life. In 2003, Blake married his first wife Kaynette Williams, who was his high school sweetheart. Sadly, they divorced three years later in 2006. Then, Blake met Miranda Lambert, who would become his second wife. The couple was married in 2011, they spent four years together, in the spotlight no less, which made the marriage even more difficult. While Blake was touring and working on the television show "The Voice", Miranda had a tour of her own. The two never saw each other, which makes a marriage difficult, and eventually the two divorced as well. Blake did not have children with either of his wives. Now a days, he is in a relationship with the singer Gwen Stefani, of the band No Doubt. Blake and Gwen met on the set of The Voice, and they hit it off from day one. They tried to keep their love a secret, but soon it was impossible, as fans could tell there was a spark between them. The couple has been together for almost 5 years, and rumors have been flying that they are officially married, but neither Gwen nor Blake will spill the beans on that one.